"...A skillful lesson on the dynamics and personalities that shaped today's America and on how far the country has evolved from a gaudy era fondly but imperfectly recalled." "...Bryson himself is captivated by the events of summer, 1927. And why not? They included Charles Lindbergh's solo flight over the Atlantic, Sacco and Vanzetti's execution, Gutzon Borglum's start on the sculpting of Mt. Rushmore, the Dempsey-Carpentier fight, and Babe Ruth's 60 home runs—all of which Bryson covers in characteristically sparkling prose." "...One Summer wins you over by the sheer weigh tof its encyclopedic enthusiasms." 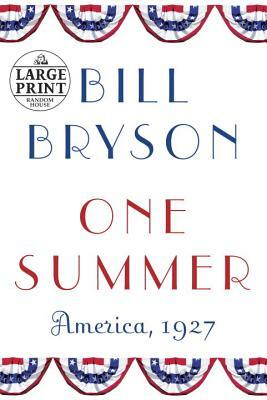 "Highly recommend One Summer: America, 1927 by Bill Bryson—interesting, entertaining visit to an incredible year."